We took Route 80 which led us all the way to Reno. Reno will be our last stop where we will be spending just a couple of days and then head home. 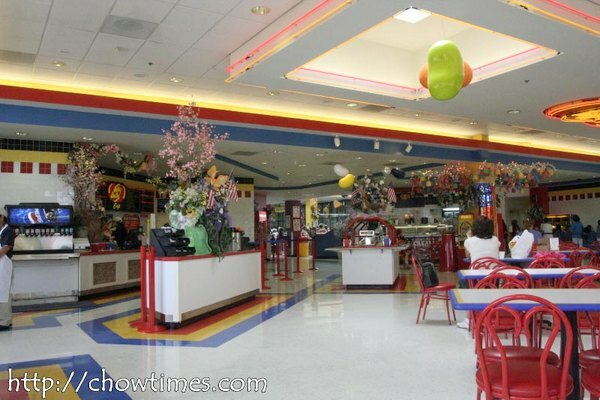 Along Route 80, in Fairfield CA, we made a stop at the Jelly Belly factory which made the world famous Jelly Belly. 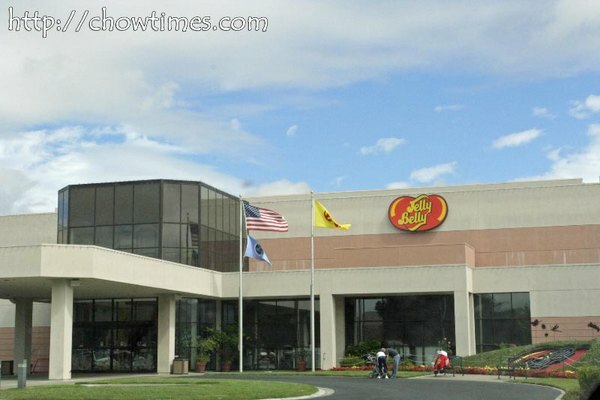 We wanted to make a stop here too because the Jelly Belly factory tour is known as the Best Factory Tour in America by Readers Digest. We had our brunch in Jelly Belly. 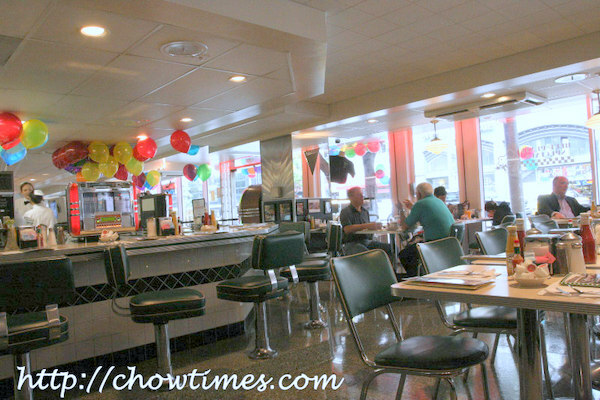 It was quite a nice restaurant they have there — bright and cheery. And the food there are quite cheap too. 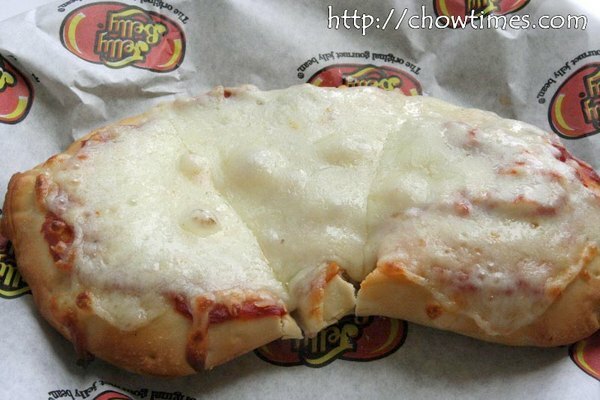 Got ourselves some sandwiches and even a pizza which is shaped like a jelly belly. Got up really early in the morning on our last day in SF. We wanted to get an early start and get to Reno with lots of time to spare. 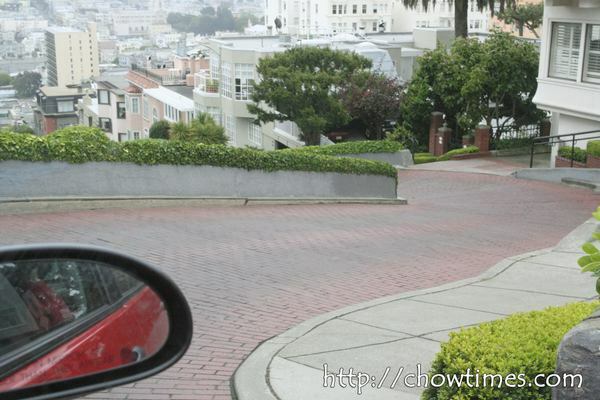 We took a slight detour to Lombard Street, yes again. We walked up and down the crooked street but we (actually I) just gotta have the kick of DRIVING down Lombard St. For a change there were hardly anybody there … no hoards of tourists, no line up of cars waiting to driving down this famous street. You know, for that few days in SF we had never seen the Golden Gate Bridge. I know now what they mean when people say that SF is always foggy. 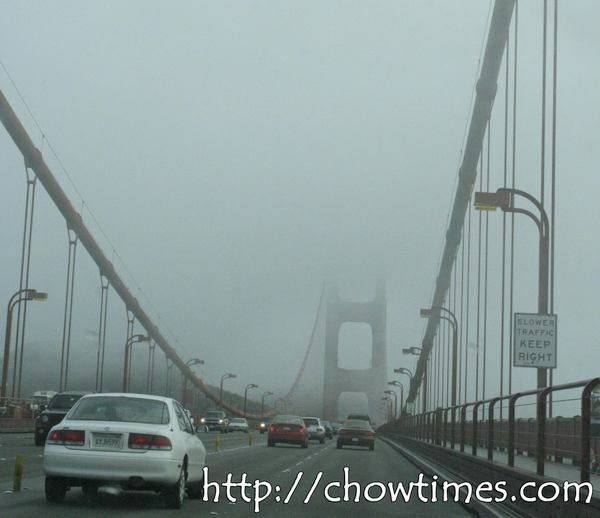 It had been foggy everyday we were there and it’s the Golden Gate Bridge had always been shrouded in fog. 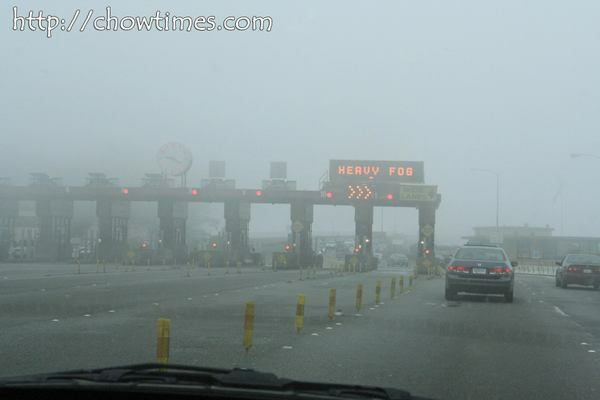 Anyway, you gotta pay toll to use the bridge but only for city bound. 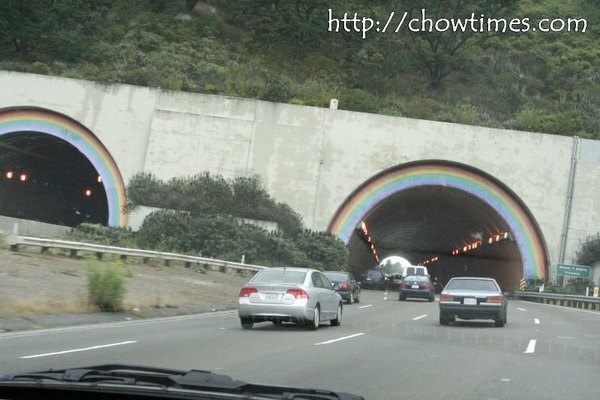 It’s free for outbound traffic. It was my last chance to take a picture of the bridge and I thought that this would be the best shot I would get. Updated: 9th Jan 2015; This restaurant is closed according to Urbanspoon.com. This buffet is unplanned … honest … cross my heart and hope to die! We were staying in San Bruno, thereabouts. 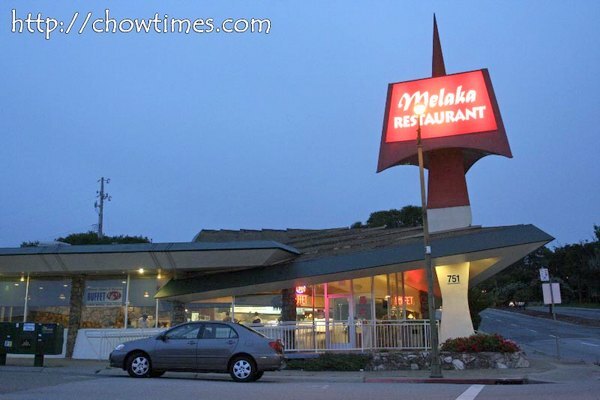 Each day driving between our hotel and the Caltrain station we can’t help but notice a restaurant called Melaka Restaurant. That word could only mean one thing in the world … it’s the name of one of the oldest city in Malaysia … and that means that it’s a Malaysian restaurant. We simply gotta check it out. We found out that it’s a buffet place. 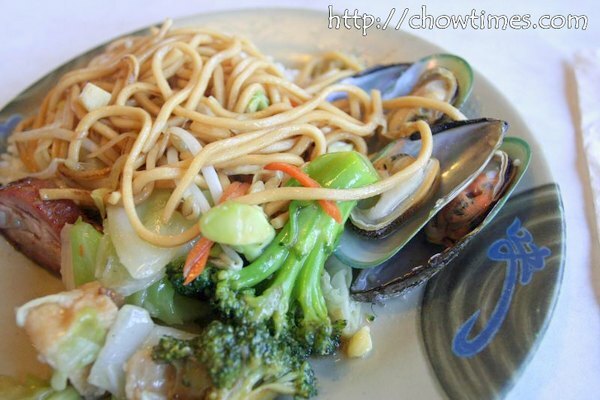 And what really made us stay for dinner is the irresistable price … it’s only about $8 or so per person. I can spot a Malaysian anywhere … from the way they dress, their hair style and especially the way they speak. You know … Malaysians have their own unique English … pretty much a mix of English, Malay and Chinese … we call it Manglish. I have loaded such a song on youtube here — it is not exactly a Manglish song but more Singlish but it’s close. I so miss the humble noodles. The mussels were just so-so. Well … I thought I share a bit more about the minor sights we visited in San Francisco. I guess it warrants mentioning because it is so … San Francisco. 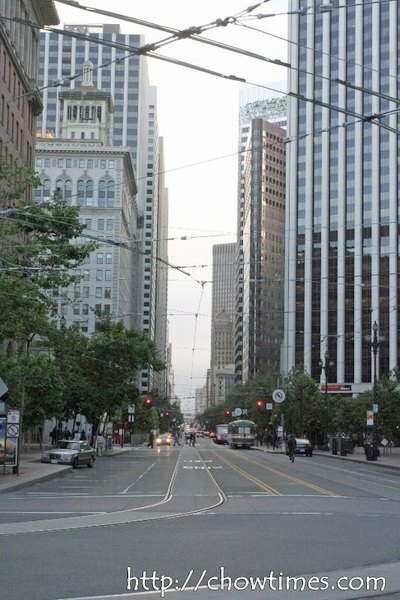 If there is a Main St in San Francisco, it is Market Street. This is the main transportation corridor of the city and is akin to what Champs Elysees is to Paris. We had taken the cable car, street cars, trolleybuses from here. Right underneath the street is where the BART runs through. 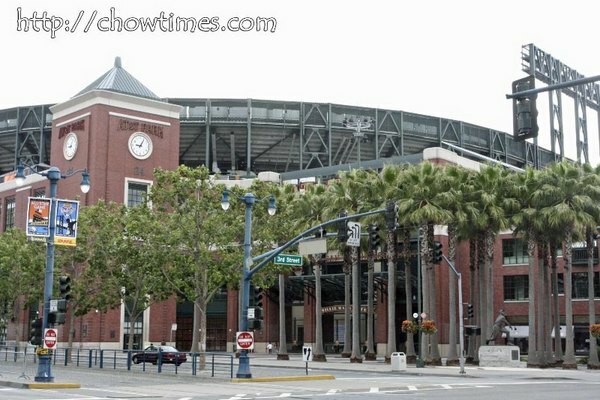 The Caltrain station is quite close to the San Francisco Giants home ground … the AT&T Park. Actually, I don’t care much about baseball nor do I understand the game at all. The only reason we are here is because of Barry Bonds — and at that time, at the threshold of breaking the all-time home run record. I have seen on the TV of some spectacular home-run hits in this stadium. You see, just outside the stadium is the bay and if someone hits the ball far enough out of the stadium it will fall into the water outside. That is called a “splash run”. Must have been pretty fun. I was told that people actually park their boats during game day hoping to get one of those balls. 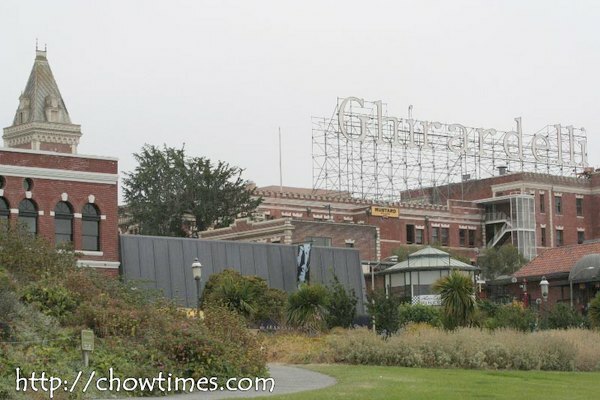 The Ghirardelli Square is another tourist attraction located at the far eastern side of the Fishermans Wharf. 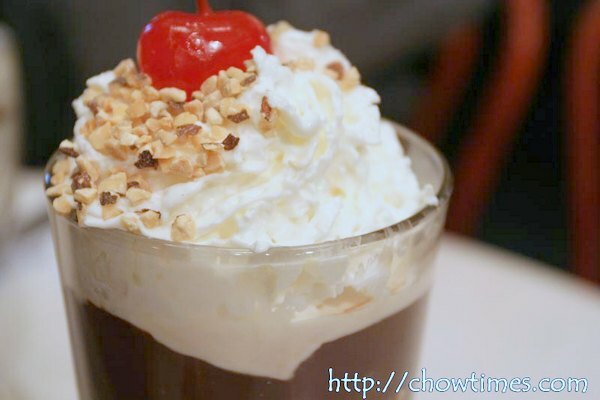 We were only interested in visiting the Gihrardelli Soda Fountain and Chocolate Shop. 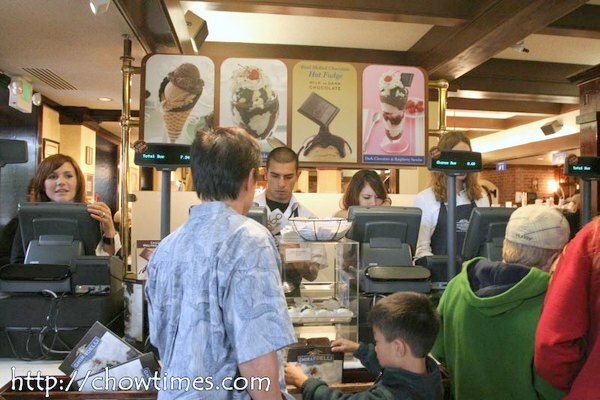 Suanne and I had fond memories of eating Ghirardelli’s icre-cream sundaes here in freezing temperatures. Back then, we had icre-cream only when the weather is hot — not so these days. 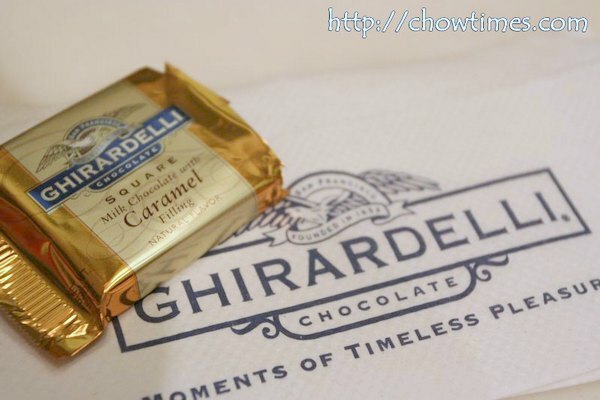 We got free chocolates by just walking into Ghirardelli … and it is not just any cheap types but the real stuff from the popular inventory. The place was busy when we got there. The was a queue that goes right out of the door. We had no idea of what we wanted to order and the menu were not much of a help because everything looked so good. We placed our order at the counter, paid for them and then given a number. We had to find a table ourselves. It’s a bit chaotic actually. The tables were arranged so tightly to each other that moving around is difficult. And because there are so many people, we had to quickly grab a table once one comes free … even before they clean the sticky chocolates and ice-cream from the tables. We ordered two ice-cream sundaes. And boy, they looked every bit decadent as it looked on their menu. 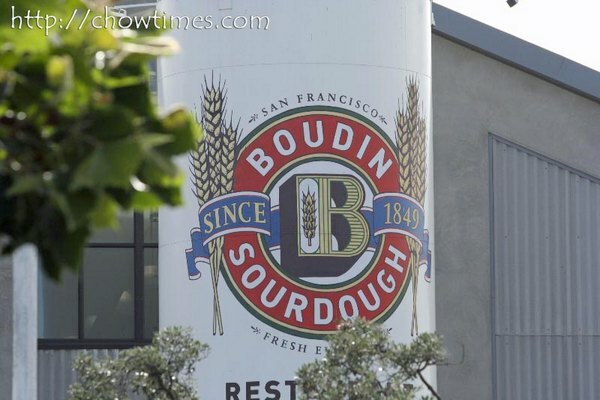 So, while in Fishermans Wharf, we also made it a point to visit the Boudin Sourdough bakery. Suanne and I had visited this bakery … oh … perhaps 15 years ago. We simply have to come back here and try their bread again. 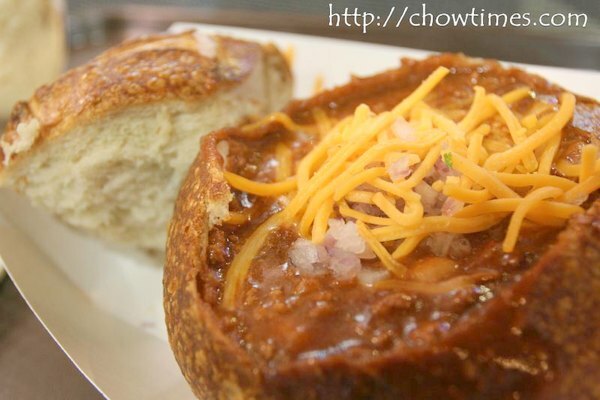 When we were in Boudin, we also made a side trip to their Museum and Bakery Tour. Frankly, it was not worth the money we had to pay to get into the tour. I would have wished that we get really close to the bakery but we just watched from an upstairs gallery. So, save your money. One thing that we learned though in that tour … that there are so many food that were invented in San Francisco. 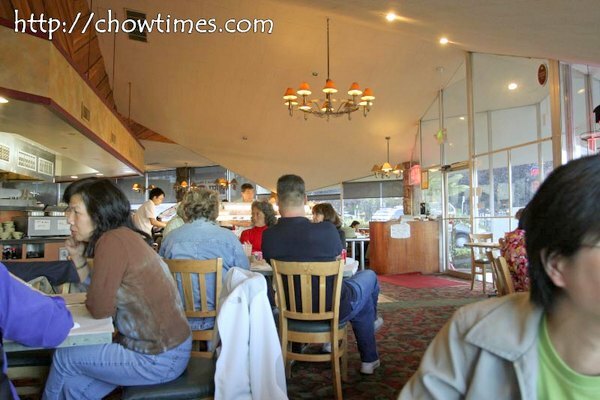 Here it is … Martini, Cioppino, Popsicles, Chop Suey, Irish Coffee, Fortune Cookie, Mai Tai, and Crab Louis. 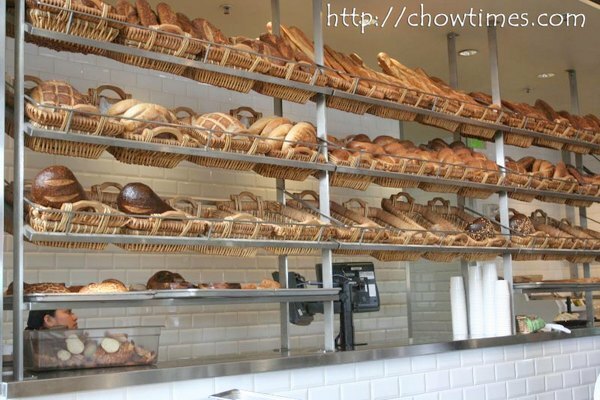 The Boudin Sourdough Bakery is popular and busy … and perhaps a bit too chaotic for me. You order and pay from one end of the counter. You have to give them your name and when your order is ready, they’ll yell your name and you go pick it up. 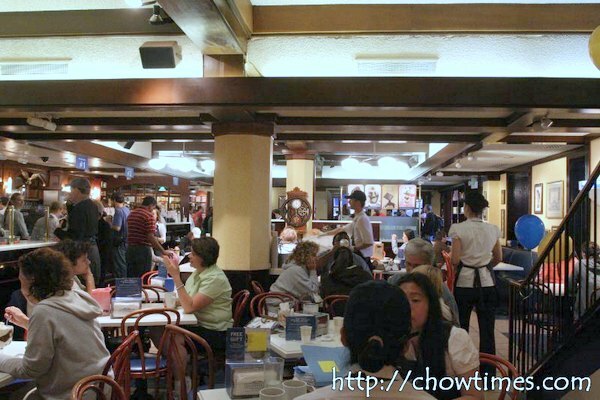 There were so many people milling around the area waiting to pick up their order and the place is so noisy. Sourdough bread was the main bread consumed in California during the Gold Rush days. 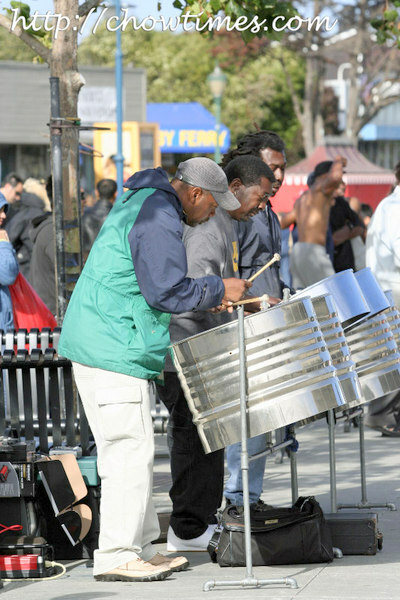 So, it is pretty much part of the culture of the SF. What is unique about sourdough is that its sourness and tanginess combines very well with seafood and soup such as chilli and chowders. We first ordered one to try but ended up getting another two more because they taste so good. 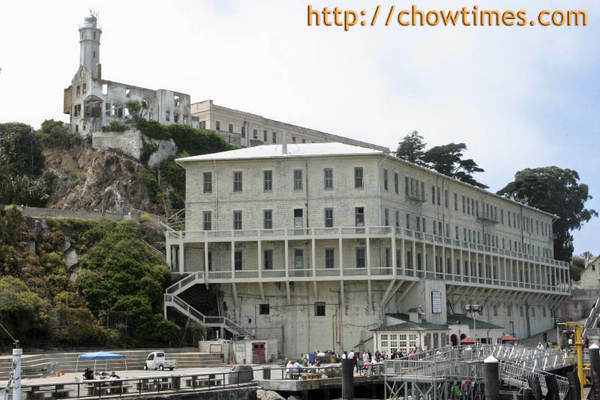 Alcatraz, also known as The Rock, had over the years been a lighthouse, a military outpost, a prison and now part of a national park. 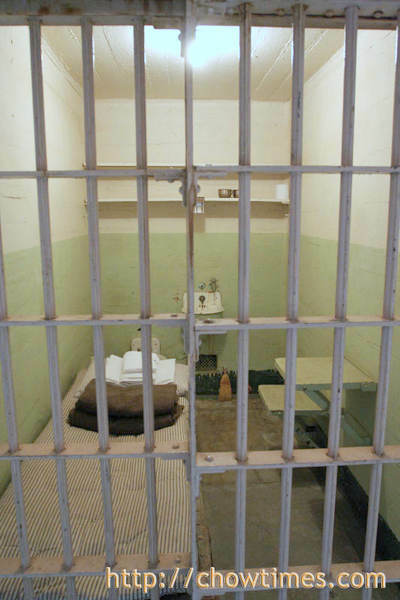 It is perhaps the times when it was a prison that captures the imagination of visitors the most. 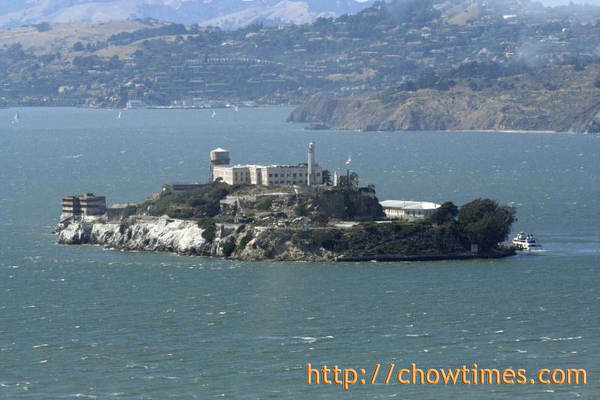 It lies smack right in the middle of the San Francisco Bay. We almost missed the boat to Alcatraz. You see, we started off from the Ghirardeli Square and thought that it is just a short walk to the pier … not knowing that it is actually quite a distance. And to add to that, there were so much things to see and do in and around Pier 39 that we lost track of time. By the time we realize what time it was, we had just 15 minutes to get to the jetty. Man! We practically ran all the way there! online two weeks before the tour and even then we had only the hot afternoon tour to choose from. I heard that if you try to line up to get on board the ship, it will be a very long wait. The prices were not cheap for the four of us … almost $100. 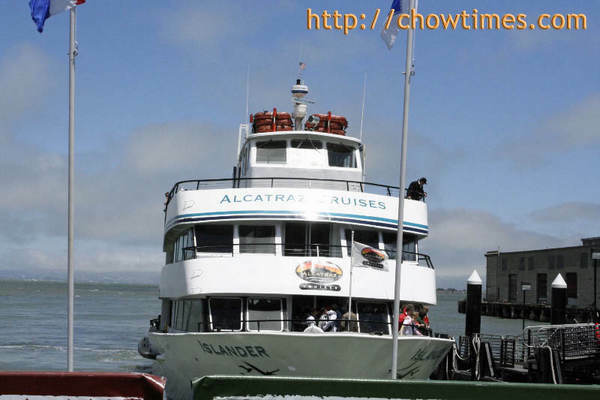 That’s for the cruise to Alcatraz and includes the entrance and audio tour. The website for getting tickets is here. Once we got off the boat, there is a mandatory orientation and history of the island before we could roam the island. Although this is not a big island, the walk to the top, where the prison is, is quite steep. 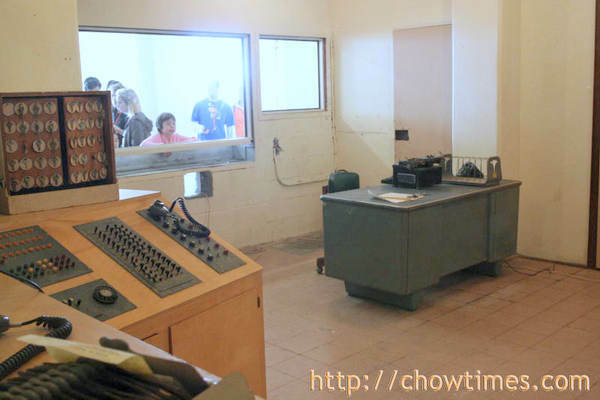 We spent quite a bit of time at the exhibits and film show near the base of the island before we walked up to the prison building. 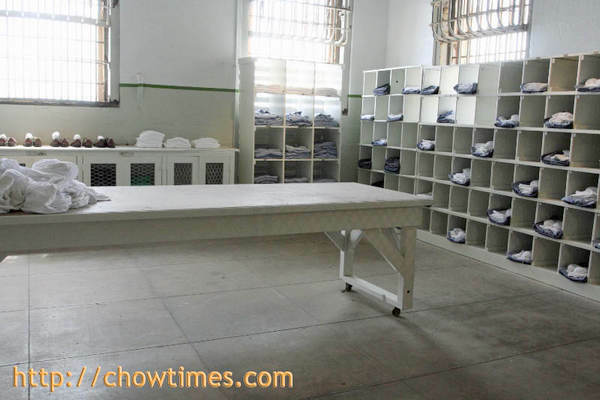 The tour was well organized which started off from the room where all new inmates were first given their prison garb and open shower. 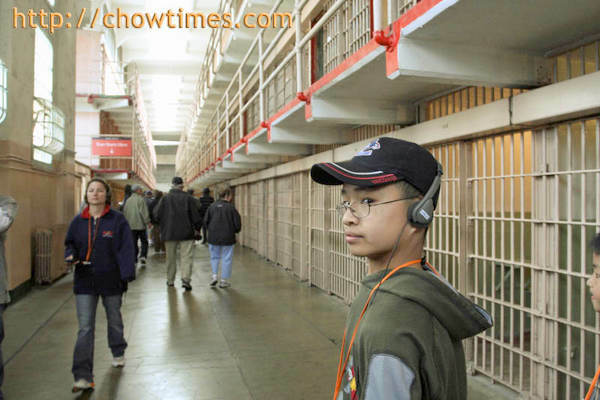 Each of us had an audio set to follow as we walked throughout the prison complex. 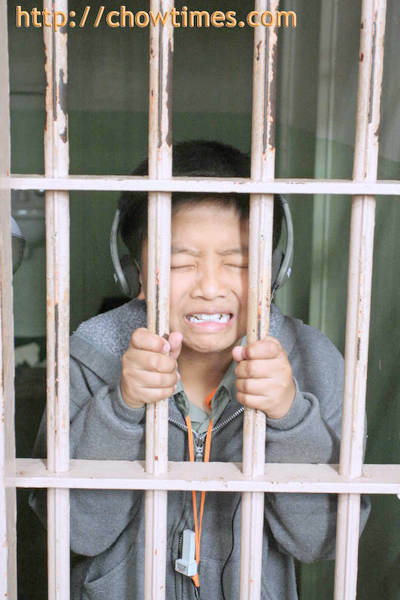 It was really interesting … not only to Suanne and I but the boys was quite mesmerized too with the stories and description of the conditions in the prison. The prison cell below were perhaps some of the “best”. The isolation cells were worse and almost completely dark except for a small light bulb. Many people took pictures behind the bars … well, we had to take some for ourselves too. BTW., crime does not pay … agreed? I bet the view from the prison must have been torturous for the inmates. Right from across the bay is the beautiful city of San Francisco. We spent most of our time just following the audio that I did not take much pictures here. In all, it was an entertaining tour, if I may say. My favourite part of the audio tour is where they described how two of the most famous escape attempts were carried out. What’s a trip to San Francisco without a stop at Fishermans Wharf right? It’s simply unheard of. 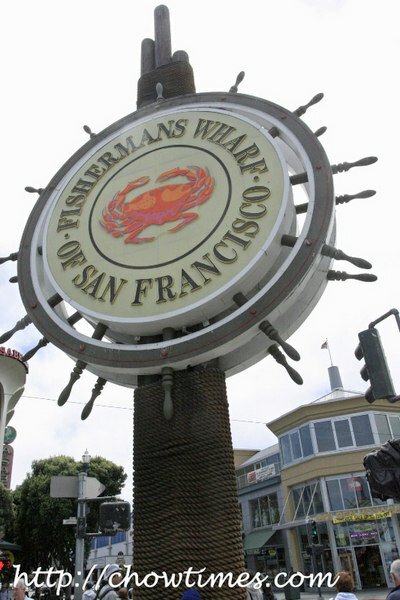 Well, I thought that Fishermans Wharf is just a short stretch but it is not, especially when we started off at the Ghirardelli Square and cover all the way to Pier 33 (??) 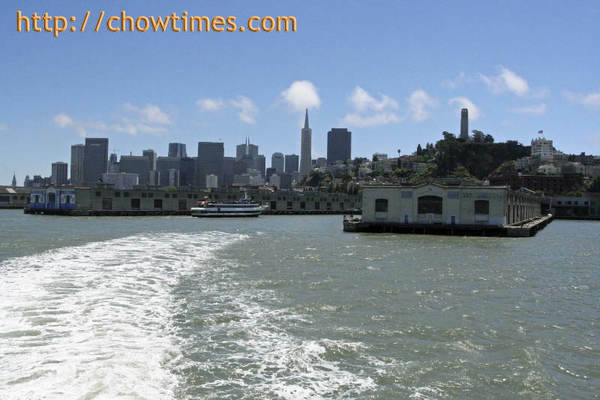 where we took the ferry to Alcatraz. 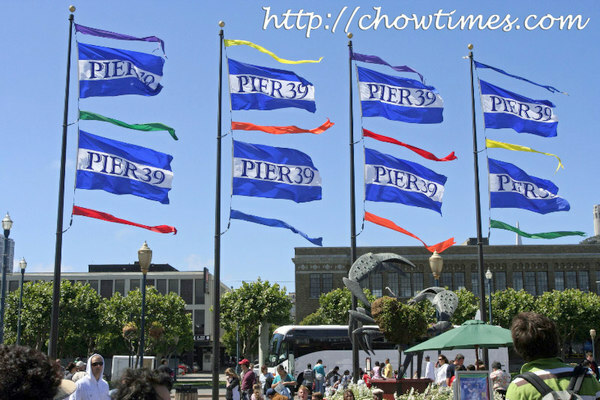 The centre piece of Fishermans Wharf is undoubtedly Pier 39. To us, it’s nothing more than a place with lots of unique shops which we have no plans for shopping. It’s basically a touristy area. I was wondering if many locals actually come here to shop and eat. There are endless things to see here. We did not get as much time to enjoy all these performances as we liked. There was this one morning we took the Caltrain to San Francisco. It was pretty early and we were deciding what we wanted for breakfast. 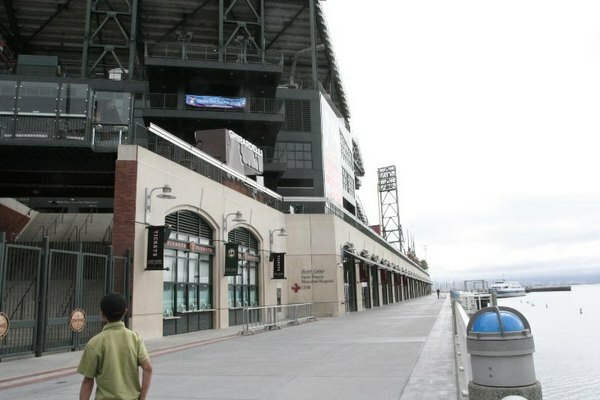 So we decided to walk from the Caltrain station near the Giants Stadium up to the Market and Powell. There were quite a few places available for breakfast. We actually had a hard time choosing because it’s either someone who wanted something else. 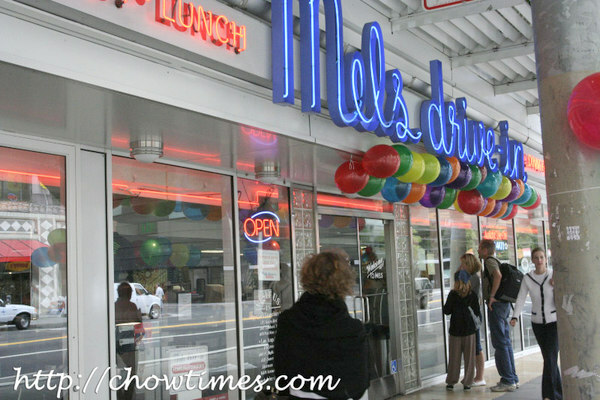 But when we came across Mel’s Drive-In, it was unanimous. I am not sure exactly what it is but perhaps it’s the cheeriness and warmth of this place. This is not a drive-in, despite its name. But it has a very nice 1950s nostalgic theme. This appears to be a very popular restaurant. 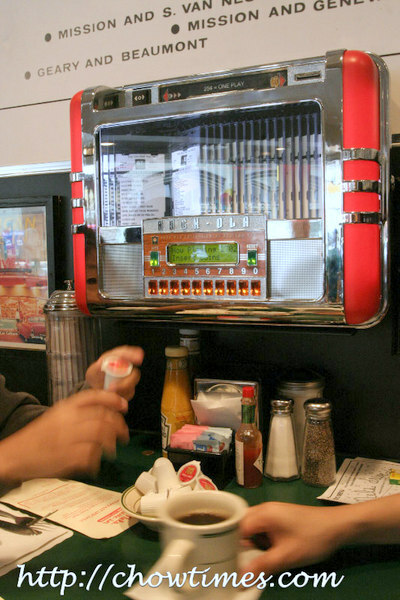 We love checking out the Juke Box on our table. Well, the boys does not recognize any songs at all. Not sure about you all, I love busy-looking table for breakfasts … you know … lots of condiments, straw dispenser, menus with pictures, coffee cups and all. We ordered three things to share between the four of us. 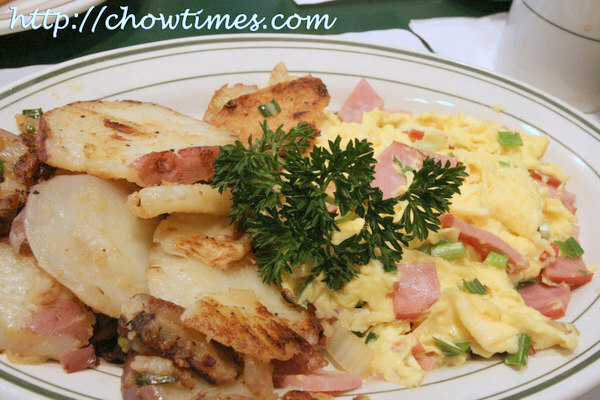 First, it was the diced ham and eggs. All of us loves eggs except Suanne. So, she stayed away from touching this. 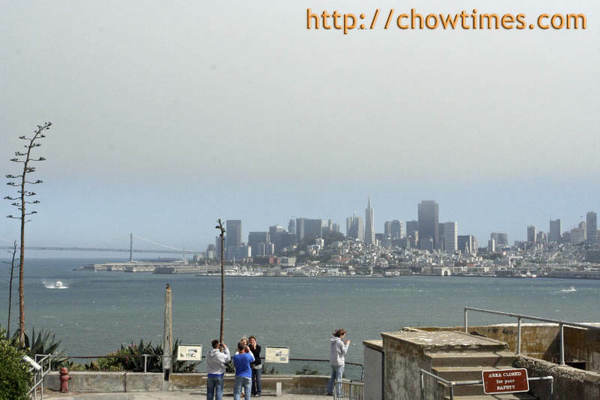 Parking in San Francisco is not only expensive but it is notoriously difficult to find. Before I started on this vacation, I asked friends about parking and almost everyone advised me to just use their transit system. One told me that he once went to a dinner in downtown, circled around the place for one hour, couldn’t find a lot and then went home. And then there was when I booked for a hotel in San Francisco and found out that they charge $20 extra for parking! So, I decided that we’ll use transit as much as we can. We stayed in a hotel near SFO (not LAX! Thanks Chubbypanda) because for some reason the hotels the week we were in San Francisco were expensive. We could get good places the week before or the week after for around $100. However, the cheapest we could get for the week we wanted was almost $200 for a crummy bed and breakfast. Some big event must be happening in town. So we decided to stay in a really nice place a bit further out and travel into the city everyday via transit. 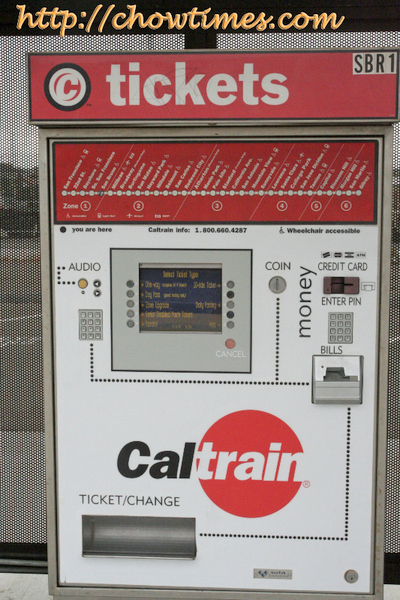 We tried BART first and found it expensive. 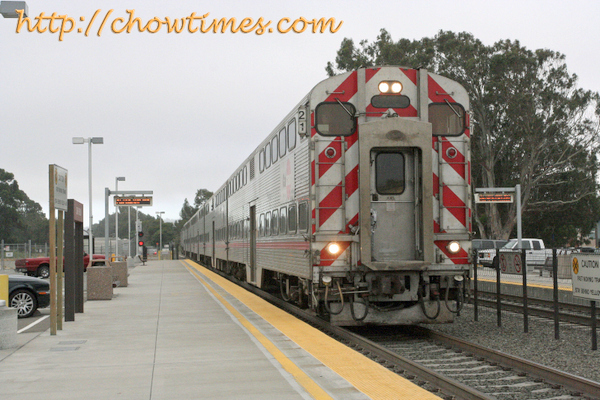 So, we decided to try a cheaper alternative — Caltrain. The only problem is that they run on a very fixed schedule — something like only 1 or 2 runs per hour. That means that we had to time our journey well, especially on the late return trip during which time they only run once an hour. 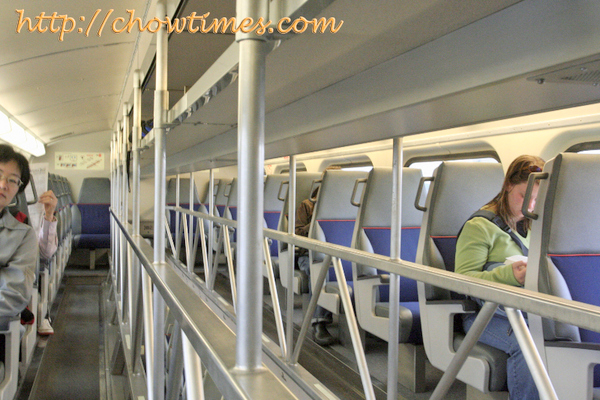 The Caltrain cars are huge and is double decker. And man, they do travel really fast … you are better off staying way clear of the tracks.